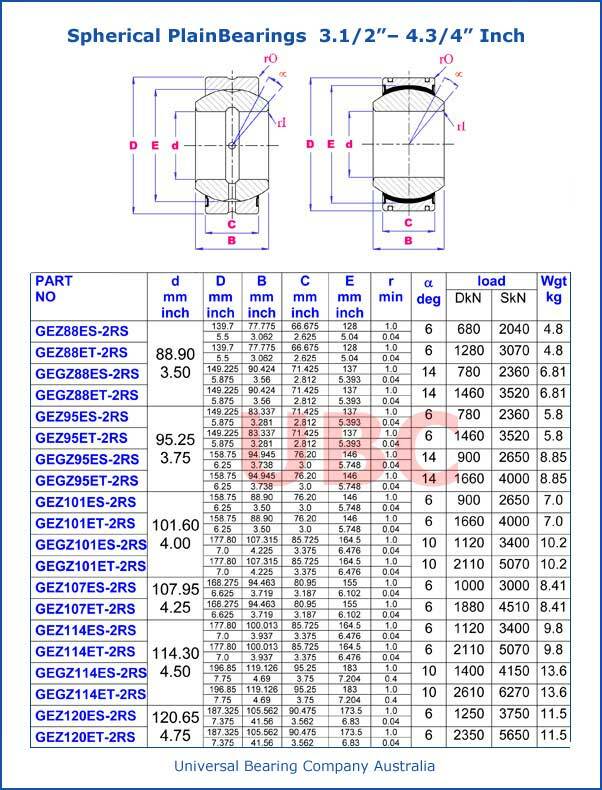 Spherical Plain Bearings 3 ½ – 4 ¾ Inch Universal Bearings Company UBC The Spherical Bearing is a heavy-duty self-aligning sliding bearing. Highly resistant to impact loads this product is most fitted to the oscillating section under slow heavy loads. The most widely used series. Used for heavy loads since the spherical contact area has a large width. The Spherical Bearing is a heavy-duty self-aligning sliding bearing. Highly resistant to impact loads this product is most fitted to the oscillating section under slow heavy loads. The most widely used series. Used for heavy loads since the spherical contact area has a large width. The outer ring is split at two points enabling the inner ring to be accommodated. This type of Spherical Plain Bearing is widely used in Europe. The outer ring is split at one point and the width and thickness are smaller than model SB. Thus this model can be used in small space.